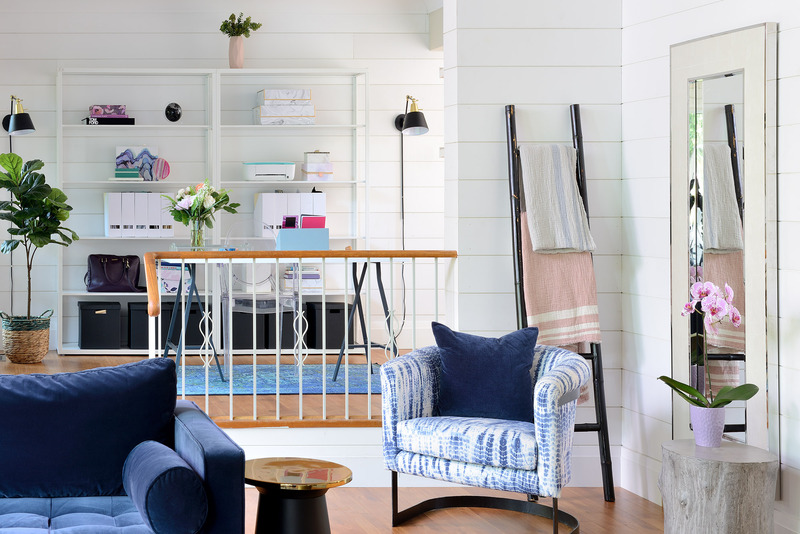 HOW TO DECORATE A RENTAL LIKE IT’S YOUR OWN – MY CANNING CABIN HOUSE TOUR! You're here! We made it! We have at long last put the finishing touches on our #canningcabin, our brand new (to us) property that we moved into 4 months ago. As many of you know, we sold our house earlier this year for a few different reasons, and we've spent the last four months unpacking boxes, decorating, and doing some small renovations in this rental property- and I am so excited to share our main floor with you today! 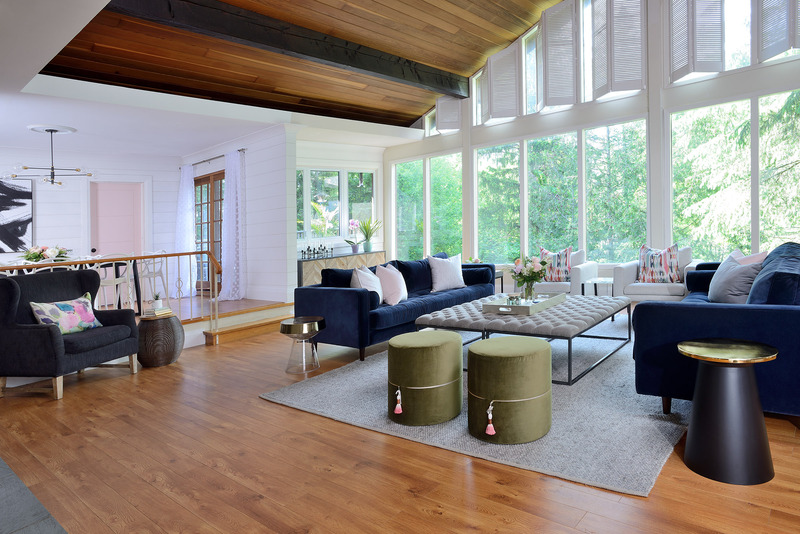 If you prefer to watch the home tour, click below, otherwise, read on! And make sure you scroll down to the end for the full list of items in the room. Decorating a rental was a challenging task for me. There were so many things I wanted to do, and I constantly had to weigh my decisions against my not unlimited budget. In the end, I am so pleased with the balance we struck in terms of making this space truly our own, making it functional for the unique needs of my large family, and making it a space that is beautiful and inspiring! I love it so much and I hope these tips on how to decorate a rental like it's your own help you in your decorating pursuits, whether you own, or you rent. This property is old and when we moved in, it was literally like stepping back in time to the 1970's. One of the biggest things that gives away the age of a property is trim (baseboards especially)- and so one of the best updates you can do to make an old rental look new, is replace your trim. Now this is an option that will cost some $$$ and might not be in everyone's budget. But because of the impact trim (especially baseboards!) make, I argue it should always be a consideration when moving into a new space. I took this one step further of course and added shiplap everywhere that made sense in my main open concept space. And as I share in my video tour, I struggled with this decision BIG TIME. The installation for the shiplap, and the material fee, was not a small one. But as I really wanted to embrace the cabin in the woods feeling this property has, and the fact that I am slightly obsessed with the textural quality that trim provides, we simply decided to make installing shiplap, new baseboards, crown moulding, and casing, a priority in the budget. Believe me when I tell you I considered other options- I looked at temporary wallpaper for renters like this and this, and I really wanted to like it, but in the end I wanted the look of the real thing, and boy am I happy with the results. I partnered with Metrie, the largest North American supplier and manufacturer of solid wood and composite moulding. I used their pre-painted shiplap, which snaps together so easily. I love how innovative the design of this product is, and I finished the shiplap off with baseboards, casing and crown from their Very Square collection. We also updated the doors. The doors were originally all louvered- as in, you could hear everything through them! And with soon to be 7 children in this house, let me tell you replacing the doors to solid core doors was a NEED not a want! 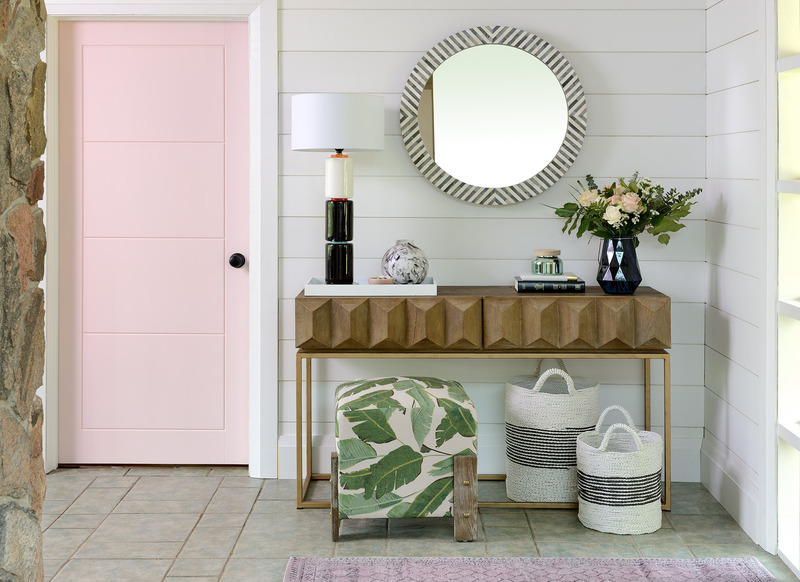 It also gave us an opportunity to do something fun with paint, and I embraced pink in my entrance way with this soft pink called Pleasant Pink by Benjamin Moore on this solid door from Metrie's Very Square collection. So while it did take up a significant portion of our budget, it was a priority for me in this space, and one I definitely do not regret investing in for the beauty and the function it has created! Another easy way for a rental to really feel like you is to be bold in your furnishings. I had been eyeing these Sven sofas from Article for a while, but was extremely hesitant to buy something like a sofa online. Honestly, the designer in me that needs to sit test things was really, REALLY reluctant to do this. But after reading several reviews online, and reviewing Article's return policy, I decided to go for it and happy to report they are really lovely. I have always loved velvet and navy blue, and have made similar furniture pieces like this for clients for $$$$. So when I discovered I could get two sofas for just over $3000 it was not a difficult decision to make. They are beautiful, but they do require maintenance. I find everything- dust, stains from leaky baby bottles, sticky fingers, etc. shows up on the navy fabric. The great news is, every single stain has come off with soap and water. The bad news is, it's another chore to add to the list of cleaning chores- so while I would 100% recommend them for their comfort, style and quality, you need to be prepared to wash stains regularly if you want them to look clean! But honestly, if these sofas can stand up to my 6 children ages 9 and under, I am pretty sure they can survive anything. I know I already talked about pink, but we must talk about it again- because I just love how this pink door looks in my dining room! 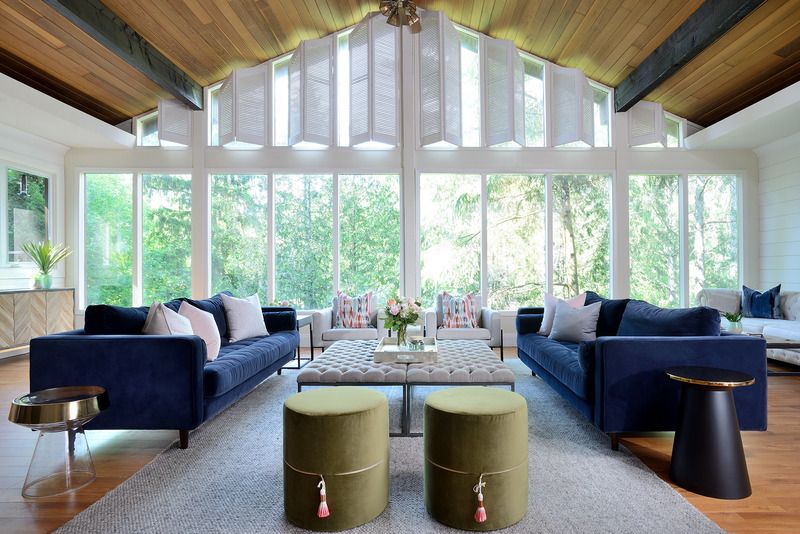 In an old space, I think a small hit of a trendy colour is just fun and unexpected. 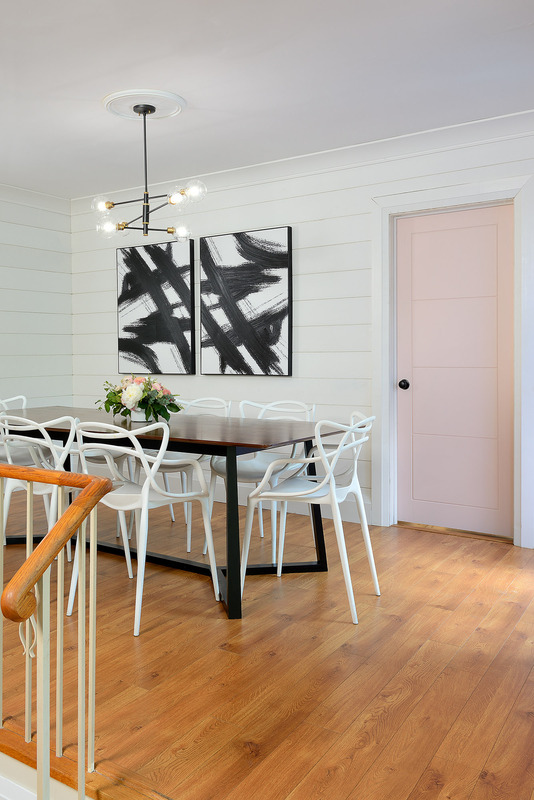 This was one of the easier decisions for me in this space- for some reason, knowing the space is temporary as it is a rental made me more bold in my paint selections. And the fabulous thing about paint, is that it is changeable- if I change my mind on this colour, in an hour and a half I can have it changed to something else. 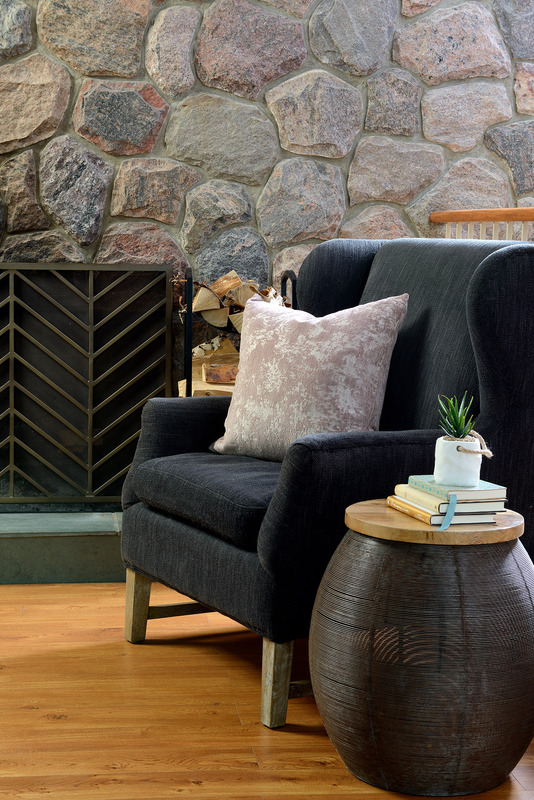 I love this hit of pink in this velvet pillow! 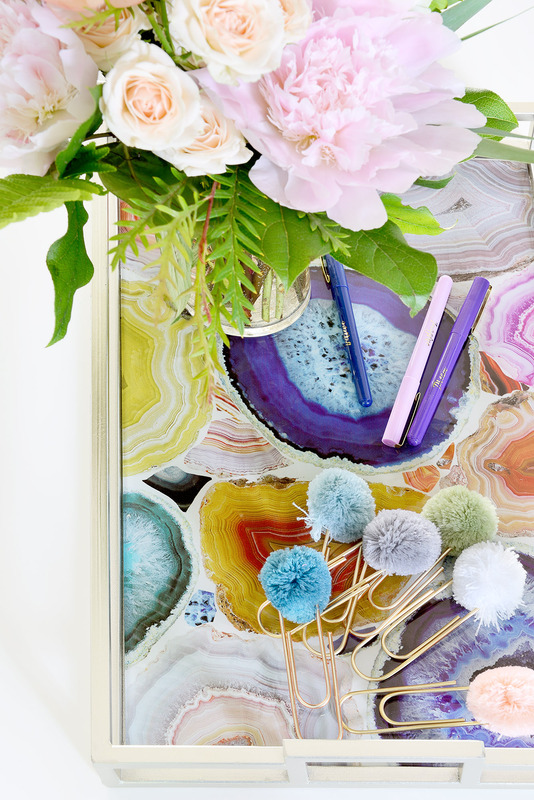 And how sweet is this colourful tray (and pom pom paperclips!) from HomeSense?! One of the things we always have to have top of mind in design is function. A space needs to make a family's life EASIER, not harder. So consider areas you need to increase function, and don't skimp on those areas! For me, I had to increase function in how I store paper and keep my business life organized. While I am a big fan of the concept of deep work, and locking myself away in a quiet space to get focused stuff done, there are lots of times when I am paying bills while my children are around, sorting receipts and paper work, and filing things that they come home with and I come home with. In the past, I have had a dedicated office space in an area away from the main commotion of the house. But what I found was that filing of everyday paper just wasn't happening as it was too far away and I never really developed the behaviour to keep paper organized. In this house, I was determined to figure out a system that would work and YOU GUYS I THINK I FINALLY FOUND ONE. 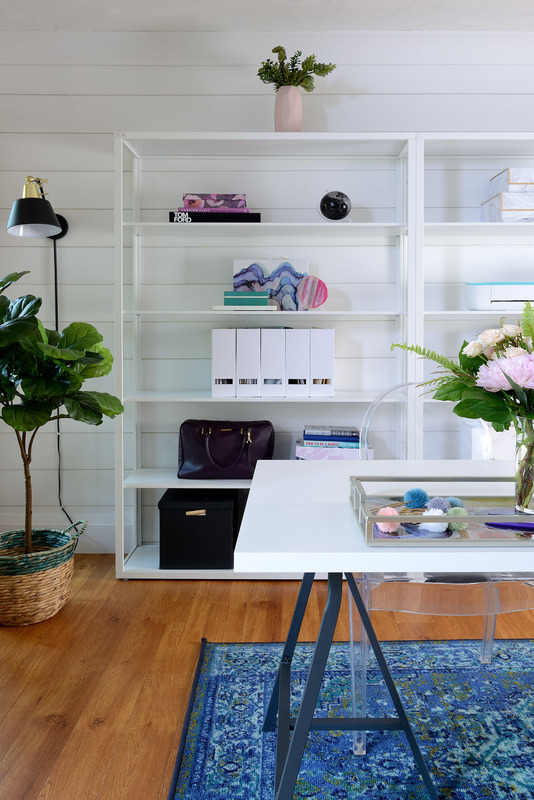 Having this office space attached to my main living room makes it really easy to find a home for school permission forms, library book reminder slips, crafts that come home from school and all my business correspondence as soon as it comes into my house. And watch my YouTube tour for a clip board system that has SERIOUSLY CHANGED MY LIFE! Organization makes me SO HAPPY! As I mentioned at the top of this post, discerning where to spend money was really challenging for me. I basically had to get really comfortable with the fact that I was spending money on things like trim, shiplap and mouldings that I would definitely not be taking with me. To make this decision more palatable, I chose to be really savvy with items I purchased, and this included shopping on the online platform Kijiji. I am a big supporter of the 2nd hand economy. In my line of work, I acquire LOTS OF STUFF, and I enjoy selling items I no longer need. To me, I just don't see the need to hang on to things I might need in the future when it could be bringing someone else enjoyment today (and money in my pocket today)! And for this project, I was able to pick up an amazing light fixture from a seller on Kijiji for $50 (check it out in my YouTube home tour) and a few other items for my home which really helped to stretch my budget. The other thing I find helpful about supporting the 2nd hand economy is that it offers less pressure to keep items you do purchase. While I am a big believer in investing in quality and things you might own for a lifetime, I am also super comfortable with the notion of changing your mind, or simply wanting new items in a new space. For example, I really love my velvet couches, and if it turns out that I own them for 15 or 20 years I will be very happy to have them! But I am also super comfortable with selling them, or giving them away in a year, or two years time, if that simply made sense for me. Finding creative ways like shopping second hand can really help get you closer to making your rental, your own. I hope this tour and my tips made you feel a little inspired today- and come back next Friday for the reveal of my master bedroom and master closet! Scroll to the bottom for a complete list of everything in this space, and thanks so much for spending a little time with me in my living room, office, dining room and entryway. Special thanks to Metrie and Kijiji for partnering with me on this project, opinions are 100% my lived experience!